Block paving is a great choice for driveways and paths. Over the years it has become the most popular choice for drives. It provides a hard surface which looks great, is comfortable to walk on, extremely durable and easy to maintain and repair. There is a massive range of colours, patterns and styles to choose from and we only use the highest quality materials when installing our customers’ driveways. We are always happy to help our customers design and create their perfect drive and gardens giving your home that fresh new look your neighbours will be jealous of. We are delighted to be able to offer our customers in Stroud, Cheltenham, Gloucester and Cirencester amazing deals on great products from all the leading block paving manufacturers. Please ask us for some samples and to have a look through our brochures on what can be achieved using block paving. A beautiful block paving driveways will not only look fantastic but will probably add value to your home. Block Paving can be laid in several different formats. When choosing block paving patterns, consideration should begiven to load bearing areas such as driveways or parking areas. These applications require block paving to be laid in an inter-locking pattern for maximum strength and wear. Block paving designs are unlimited. 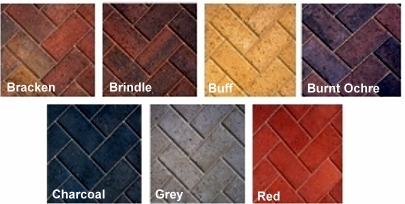 Each type of block paving stone or brick is available in a range of complimentary colours and textures. By rotating the block in a different direction, it can appear a different shade of colour. With the addition of octants or circles, paving features can be created. This can be complimented with the use of kerbs and edgings to create beautiful block paving designs and patterns. Herringbone paving patterns are constructed from 2:1 blocks, eg: Marshalls Driveline 50. This means the bricks are twice as long as they are wide. Interlocked and laid as 90 degree herringbone or 45 degree herringbone. The layout can be enhanced with subtle colour changes in blocks and or the use of pattern features such as circular or octant paving. 45 degree extended herringbone is generally used on larger areas to enhance the block paving pattern aesthetics. 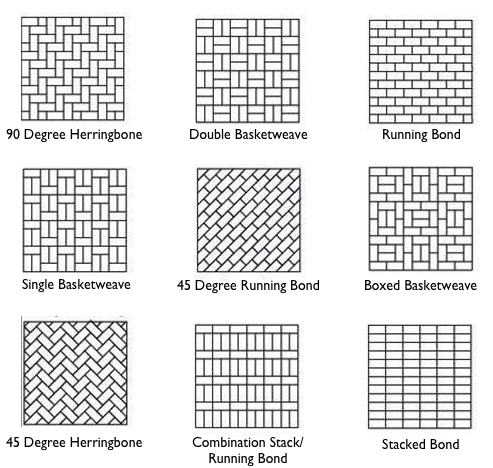 Stretcher bond and basket weave paving patterns are used for pathways or patio areas with light foot traffic. These block paving patterns can be combined with octant and circle features to create beautiful designs.